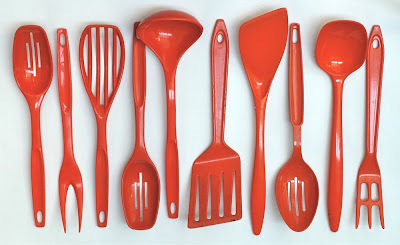 Vintage orange plastic spoons and spatulas. love the colour here. and the arrangement of course. Wow they are in great condition - does that mean spatulas were better quality before, did their first owners not cook with them or are mine just rubbish? nice! i love the color! Your collection is very cool. Yeah, I guess they're vintage. I love this one, there is a possibility to buy one of these pictures?